"You can acquire chic and elegance, but style itself is a a rare thing" - Irene Sharaff, costume designer for West Side Story (1961). Please scroll down to see images of The Maria Handmade Skirt modeled and in closer detail. We invite you to visit the link directly below, as well. Inspired by: West Side Story (1961). Colors: Peachy-pink with soft white along the bottom hem. Note: this color was tricky to shoot, which explains the slight variation between photos. It's NOT orange, but rather peach. Closure: A back zipper with two sets of hook-and-eye closures. Label: No label, handmade item. Unfinished fabric along the bottom of the skirt, visible when worn across most of the bottom hem area. Slight staining, please see images in the gallery below. Minor snag on the back of the skirt, less than 1/2". The back hook-and-eye closures are positioned in such a way that there is some fabric overhang, which could be fixed by slighting adjusting the current position of the closures. Please see the image in the gallery below. Shown here with tulle. Tulle skirt is not sold with the Maria skirt. Small spot on bottom hemline. Visible threading at the hemline. Slight fabric snag on the front of the skirt. Actual skirt is more peach in color, less orange. Back closure close-up. 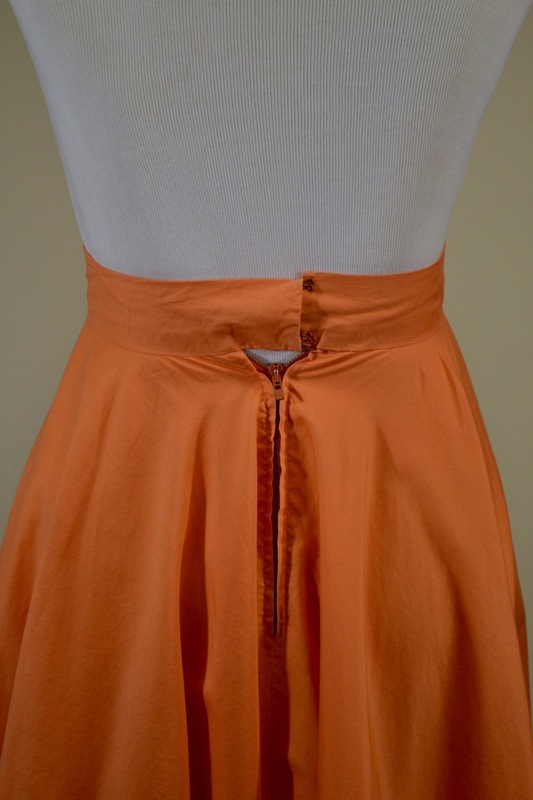 This skirt is a bit snug for the model, so the zipper isn't fully closed. Actual skirt is more peach in color, less orange. Worn by Jenn. Notice the slight overhang of extra fabric when the hook-and-eye closures are secured. Very small spot on front left panel. Actual skirt is more peach in color, less orange.